So popular they named it more than 50 times! The Breadcrumb Sponge is a common Sponge found in the Mediterranean Sea and Northern Atlantic Ocean. And when I say "found" I really mean found! 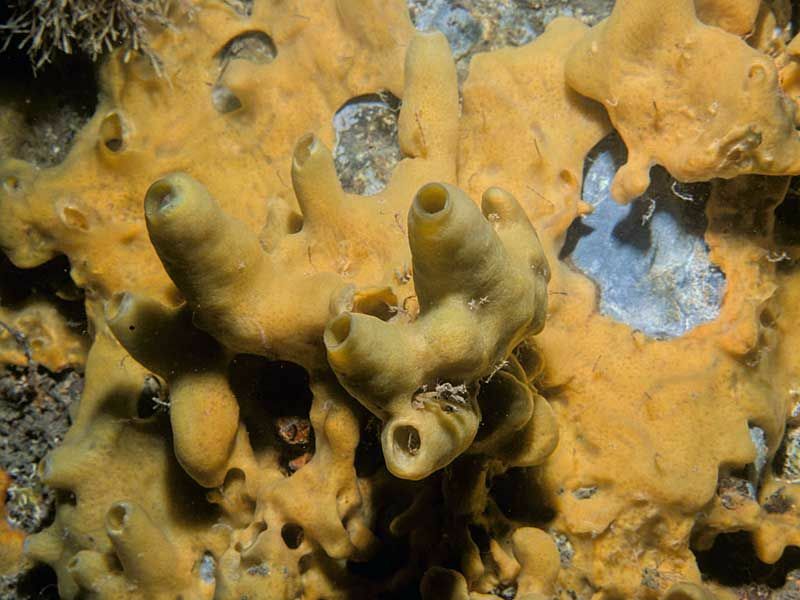 This sponge has been repeatedly discovered and named and discovered and named by enthusiastic scientists who didn't realise it had already been discovered and named. Often the very same scientist would discover and name it after he himself had already discovered and named it! 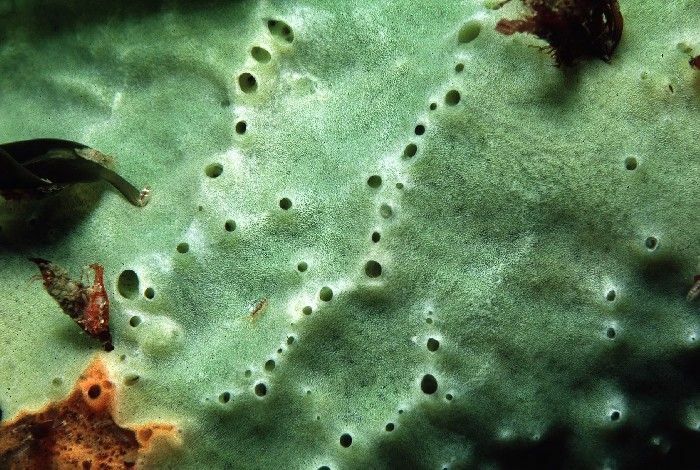 It was first named Halichondria panicea in 1766 by a wide-eyed German called Peter Simon Pallas, who immediately also named it Halina panicea and Spongia panicea. And then Carl Linnaeus gave it a fourth name the next year. In 1936, 170 years later, it acquired its 56th and final scientific name, leaving it the world record holder for massive number of scientific synonyms. This feat was achieved with the particular help of one poor sod called James Scott Bowerbank. The man named the same sponge 25 times! Even his own death couldn't stop him as he gave it 4 more aliases in a book published posthumously. A question clearly arises: "why is everyone in the world so unbelievably stupid?" Aaahh, the eternal mystery. 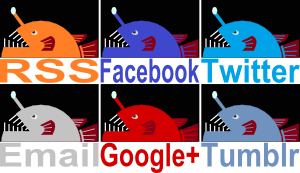 But that's beyond the scope of this blog, so let's take a look at the Breadcrumb Sponge instead. It gets its common name from a granular texture which makes it look like breadcrumbs, although it's often so smooth it's almost glassy. Like other sponges it has tiny pores for taking in water, and larger ones for venting it once the tasty bacteria has been filtered out. Completely different but also the same. But lack of breadcrumbs isn't the problem for people trying to recognise H. panicea when they see it. The real problem is its amazing versatility. Sure, it can tolerate the kind of crashing waves and powerful currents you would expect on a North Atlantic coastline, but it can also survive in depths of over 500 m (1,640 ft) and make some appropriate alterations to take advantage of more clement waters. Where the waves are really strong, the Breadcrumb Sponge will be a thin layer of crust on rocks. In more sheltered areas where they can afford to be a little more vertical, they may get some 20 cm (8 in) thick. If the currents aren't too strong the chimneys can grow and grow or become elaborate, branching structures. It can also grow as a cushion, looking something more like an entire loaf of bread. Then there's the problem of colour. 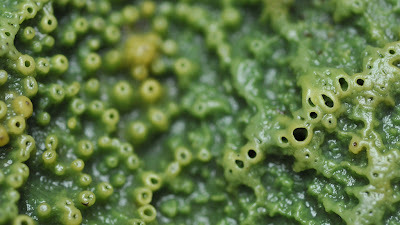 In the sun, the Breadcrumb Sponge is green due to symbiotic algae living within its tissues. In the dark, it looks more white or yellowish. This is the case not only in deeper waters, but also any sun-sheltered areas or even in winter! With all this variety in shape and colour dependant on where and even the time of year you find it, it's no wonder so many nature folk are left confused to this very day. Perhaps we're not so stupid after all! We just get outwitted by a mindless sponge. Could happen to anyone.